Intentionally or otherwise, war readily produces famine in poor countries. Such indirect deaths often far exceed the number of battle deaths. A sixth of the population perished this way during the western-sanctioned Indonesian invasion of impoverished East Timor in 1975. It stopped only when Indonesia considered the annexation a success. 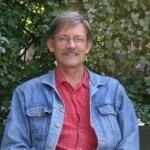 Perpetrators tend to divert blame for these indirect deaths to the ecology, but international law holds them responsible. When genocidal violence threatened in East Timor in 1999, quick international intervention ended the killings before they had exceeded 2,000. A huge proportion of housing and infrastructure was burned to the ground, and hundreds of thousands were displaced, but it could have been worse (Robinson 2009). Yet twenty-four years earlier in the same territory, atrocities ended only with the decimation of the losers. The same Indonesian troops and their local allies were involved. This time the western powers helped too. Far less cumbered by human rights protests than they would be in the 1990s, they encouraged the invasion, then looked away when it turned nasty and helped Indonesia keep it a secret. The Timorese truth commission CAVR undertook extensive and cutting-edge research to determine the likely death toll due to deprivation in excess of “normal” mortality. After correction for loss of collective memories, this came to 104,000, with a lower bound of 84,000 and an upper of 183,000 (CAVR 2005; Silva and Ball 2006). This is more than five times higher than the additional toll due to targeted killing and disappearance of civilians, estimated at 18,600. East Timor occupies the eastern half of the island of Timor, at the dry eastern extremity of the Indonesian archipelago and separated from northern Australia by the Timor Sea. Its subsistence population then of around 600,000 remains today by far the region’s poorest. In 1974, Portugal’s Carnation Revolution encouraged intellectuals in most Lusophone colonies, including East Timor, to start national liberation movements. In August and September 1975 a short civil war between rival parties left the radical nationalist party Fretilin in control. The losers fled across the border into the arms of Indonesian forces already mobilising for an invasion. Jakarta’s anticommunist military regime, then at the height of its powers, regarded a Fretilin East Timor as a Cuban-style security threat to its poorly governed eastern archipelago. Australia was anxious to maintain good relations with its Cold War ally to the north, and declared East Timor too small to be independent. The United States followed Australia’s lead. Both encouraged an invasion, provided it was quick and clean. The international armed conflict that ensued was neither. Both countries sent diplomatic observers to Timor throughout the conflict, but kept their reports a secret. Indonesia invaded East Timor’s land border in October 1975, then Dili on 7 December, and Baucau further east along the north coast a few days later. Troops repeatedly committed public massacres, particularly in Dili. It took the three years between late 1975 and late 1978 for Indonesian forces to battle Fretilin forces to exhaustion. The small half-island was during those years divided between two regimes: one in the towns led by Indonesian soldiers and their Timorese collaborators, one in the mountains led by Timorese nationalists. Fretilin at first controlled more than half the population. 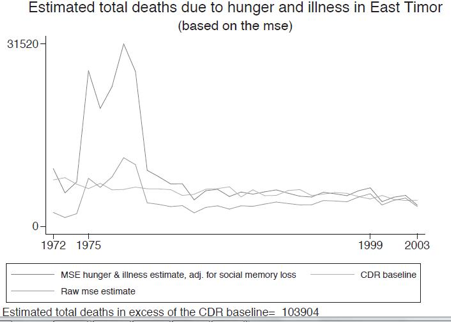 Massive death by deprivation occurred in the mountains of East Timor in those three years (see graph). In addition, wherever people surrendered in subsequent months, Indonesian soldiers systematically massacred Fretilin leaders. After the collapse of the last base d’appoio on Mount Matebean in the east late in 1978, the killing operation took weeks. Responsibility for targeted killings and disappearances of civilians is easier to determine than that for famine deaths, and this is a general problem (Thoms and Ron 2007). The CAVR found 70% of the total killings were attributable to Indonesian forces and their allies (rising to 100% by 1999), and a surprisingly high 30% to the Timorese resistance. By contrast, nobody killed those 104,000 famine victims directly. They died from hunger and associated weakness because they could not harvest or carry stores. But the use of a national retrospective mortality survey, a comprehensive gravestone survey, and a large database of voluntary statements to the commission allowed the CAVR to confidently attribute the overwhelming responsibility for these deaths to Indonesian military and government officials. The deaths were both foreseeable and a direct consequence of Indonesian military strategy. As Indonesian forces approached, Timorese townspeople fled to the mountains. In some places they went spontaneously, driven by news of massacres. Elsewhere local Fretilin government committees forced sometimes reluctant citizens into the mountains, despite absent preparations to feed and house them. Notably in Baucau the view prevailed that a government without a population has no sovereignty. Multiple leadership conferences later reinforced the decision. Fretilin-led local committees in the hills soon organised people into brigades for food production. They did a good job maintaining order. But subsistence farmers have no surplus. Contrary to the mobile, resisting peasant depicted by James Scott (1987), they must stay still long enough to plant, tend and harvest crops. As Indonesian forces pushed into the interior beginning in late 1977, people moved to evade them. Soon famine broke out. Fretilin leaders continued to insist people must stay in the mountains. A preponderance of deaths occurred just before surrender. The CAVR found that Fretilin “share responsibility for the consequences of their actions”. The Indonesian military, meanwhile, systematically destroyed food crops and stores and cut off food supplies to the interior, in order to force people to surrender. It bombed populated mountain areas, occasionally with napalm. As troops encircled mountain bases, people repeatedly moved without adequate food in hand. Relentlessly pressing their encirclement campaign from west to east, they forced Fretilin gradually to release their populations. Those who surrendered were contained in “concentration camps” (based on South Vietnamese strategic hamlets). Soldiers stopped them from farming, yet withheld adequate food aid so they wouldn’t help the resistance. Hungry people will not revolt. Atrocities declined sharply after 1979 once the Indonesian side had won control over population and territory. Satisfied it had reduced guerrilla resistance to insignificant levels, Indonesia allowed international aid teams in, opened the concentration camps, and allowed the economy to recover. Although we still have not seen their archives on this period, these organisations probably could not have done much more than they did to reduce the death toll. When the American-backed Catholic Relief Service (CRS) brought food aid into the camps the worst remaining problems stopped. There is bitter irony here. Even for the winning side, this bloody outcome was not optimal. Indonesia was left in physical control of the towns, but not of the mountains, where low level guerrilla warfare continued for decades. It controlled most bodies but few hearts and minds among the traumatised population. Once news of the atrocities broke through the Indonesian and Australian information blockade, it deepened Indonesia’s diplomatic isolation. Within Indonesia, the East Timor atrocities exacerbated New Order militarism. Soldiers brutalised in Timor acted out their aggression elsewhere. They demanded impunity everywhere, censored the press, and pushed out sensible solutions in other arenas of regional unrest in favour of nationalist paranoia. For the general population of East Timor, the starvation and migrations created huge dislocation for the survivors. Large parts of the fertile mountains (which catch more rain) remained off-limits to farmers. The decimated stock of buffalo, horses, cows and pigs took decades to recover. Towns grew quickly but lacked services. Domestic violence increased dramatically. The rapid introduction of a cash economy, as Indonesia tried to buy off dissent with employment in the civil service, exacerbated urban-rural inequality. Human rights abuses continued to multiply unchecked for years after the surrenders. The losing Fretilin side gained a propaganda advantage. They now looked like a national liberation movement with no blood on its hands save that of the military occupier. The atrocities it had committed against its own population in the mountains, by deprivation and by vengeful internecine torture and executions as Indonesian pressure increased, were yet unknown outside. The atrocities did not in fact serve the interests of any of the perpetrators. If they had acted on the possibilities to reduce them even after hostilities had started, they themselves would probably have benefited. Fretilin could have reduced famine deaths by ordering people back to the Indonesian-controlled towns. These would have much sooner become bases for non-violent resistance and clandestine support to mountain guerrillas. Indeed, Fretilin’s first president Francisco Xavier do Amaral (deceased 6 March 2012) promoted this strategy at the time of the invasion. His faction lost the dispute and he was first condemned for high treason and then allowed to be captured by Indonesian forces in 1978. The Amaral plan would most likely not have harmed the eventual outcome of the nationalist struggle. When the surviving leadership eventually came to the same position in late 1978, the final death toll had nearly been reached, mainly among the very young and the old. In other words, it is not sustainable to argue, as is done today, that the deaths by deprivation were the price that had to be paid for independence. Indonesia could have reduced the civilian hunger toll if its strategy had been more like that of the British during the Malayan Emergency. This may still have involved temporarily isolating the population from the guerrillas, but adequate humanitarian assistance in the towns would have greatly reduced the toll. As the effective occupying power, Indonesia was also under obligation to allow humanitarian assistance into the mountains. CRS and the ICRC were willing to do this. Far from prolonging the conflict by feeding the enemy, as military hawks argued, this might have brought Fretilin moderates into fruitful contact with the Indonesian occupier. Some hybrid, highly autonomous local regime could have emerged, like Hong Kong after the transfer from Britain (which also took place under an authoritarian central regime). Arguably, doing this might have improved the likelihood of long term success for the annexation, and would at least have favoured a non-violent resolution. Arguments in favour of Indonesian annexation by the foreign powers Australia and the United States were also strategically spurious (to say nothing of international law). Economic viability turned out to be no objection to independence after 1999. Cuba was a more realistic worry, but East Timor was probably too vulnerable to blockade by its neighbours to ignore their wishes. Oil reserves, also a consideration, could have been and in fact were later shared. The overwhelming responsibility for the massive death by deprivation lay with the Indonesian militarised government and its western allies, who decided they must take unchallenged control of people and territory quickly and at all costs. The CAVR found that “members of the Indonesian armed forces and government officials committed war crimes and crimes against humanity in formulating and implementing policies which caused mass starvation and death.” It is they who invaded, who pursued the war using famine as a weapon, and who misused their control over infrastructure to deny international assistance until after their strategic goals had been achieved. The deaths by deprivation were the predictable result of tactics the aggressors deployed in a poor country. Ecologically, Timor offers its subsistence population no surplus to cushion disruption. Farmers speak of “normal hunger” every year before the new crops mature. The CAVR examined rainfall records and found there was no below-average rainfall in those years that could have caused famine. The main point, however, is not the accident of drought but the permanent reality of a fragile subsistence economy. Indonesia’s own longstanding strategy of resorting to guerrilla struggle in case of foreign aggression should have alerted its leaders to the likelihood that an invasion of a highly politicised Timor would not be as clean as they had promised the Americans it would be. Indonesia’s main western ally also failed the test of responsibility. Australia should have known better, because in 1942 it triggered similar death by deprivation in Timor (which borders northern Australia) when it decided to experiment with guerrilla resistance against the Japanese. This led to between 40,000 and 60,000 civilian deaths. War-related massive deprivation in poor and ecologically marginal areas deserves special attention. The amplification of human misery caused by military action in such an environment also amplifies the responsibility of perpetrators and their backers. The Geneva Declaration (2008) has found that, since quantitative data has become available from the early 1990s, indirect deaths due to warfare have averaged about four times the direct deaths, with underdeveloped countries faring worst. It is true that, if military perpetrators even today face only minimal pressure on the issue of war-induced starvation, public awareness was in the 1970s even less (actively helped by information blockades). But the Fourth Geneva Convention that bans “extermination” of civilian populations in article 32 goes back to 1949. Article 54 in the First Additional Protocol, prohibiting the destruction of material essential for the survival of the civilian population, was nota bene formalised at the height of the Timor famine in 1977. Western encouragement of the Indonesian militarised change project in East Timor in 1975 therefore falls into a broad pattern of gross international irresponsibility. The pattern continues with similar projects in fragile environments today, from Afghanistan to southern Sudan, from the Democratic Republic of Congo to Papua. An expanded international “Responsibility to Protect” in poor and ecologically marginal countries ought to give a new impulse to reinvest in long-term democratic governance, including international mentoring, especially in the world’s most fragile lands. The Belgian historian David van Reybrouck, author of the award-winning historical novel Congo, recently made an eloquent plea for precisely this approach. The West urges quick solutions in such places because it feels guilty about its own colonialism and wants to keep its involvement to a minimum out of respect for national sovereignty. Recently this resulted in western demands for quick elections after a civil war in Congo, a recipe for more bloodshed. In 1975 it resulted in a western green light for the “quick” Indonesian invasion of East Timor, because the alternative was to get involved in the long term. Massive death by deprivation associated with war is fundamentally a failure of global governance. That kind of failure is preventable. CAVR (2005) Chega! The Report of the Commission for Reception, Truth and Reconciliation, Timor-Leste, Dili: The Commission for Reception, Truth and Reconciliation (CAVR). [www.cavr-timorleste.org]. Geneva Declaration (2008) “The global burden of armed violence”, Geneva: Geneva Declaration Secratariat. Robinson, G. (2009) “If you leave us here, we will die”: how genocide was stopped in East Timor, Princeton, NJ: Princeton University Press. Saul, B. (2001) “Was the conflict in East Timor ‘genocide’ and why does it matter?”, Melbourne Journal of International Law, 2: 477-522. Scott, J. (1987) Weapons of the weak: everyday forms of peasant resistance, New Haven: Yale University Press. Silva, R. and Ball, P. (2006) ‘The profile of human rights violations in Timor-Leste, 1974-1999: a report by the Benetech Human Rights Data Analysis Group to the Commission on Reception, Truth and Reconciliation of Timor-Leste’, Palo Alto, CA: The Benetech Initiative. [www.hrdag.org/resources/Benetech-Report-to-CAVR.pdf]. Thoms, O. N. and Ron, J. (2007) ‘Public health, conflict and human rights: toward a collaborative research agenda’, Conflict and Health, 1: doi:10.1186/752-505-1-11. The shocking “worse than Biafra” photographic report on the famine by Australian diplomat Peter Rodgers (Sydney Morning Herald, 1 November 1979) was an unauthorised leak. The CAVR did not commit to a view on genocide. The narrow definition in the Genocide Convention does not acknowledge massive civilian death caused by action directed at a political group in order to control a territory politically (Saul 2001). One shouldn’t conflate the intra-Fretilin fratricide that occurred in the second half of 1977 with the famine from early 1978 onwards as though they were the same event. The former certainly occurred (e.g. the execution of Aquiles Soares and Francisco Hornay in 1976 and the arrest of Xavier do Amaral in September 1977) and people were indeed prevented from surrendering at the time. But (1) the whole Fretilin Central Committee had its last meeting in August 1977 in Laline, Viqueque. It never met as a whole after that. (2) Fretilin’s C3 (command, control and communications) were severely weakened after ABRI’s August 1977 offensive, so the idea of a territory-wide policy (or ability!) of preventing surrenders is doubtful. (3) It wasn’t preventing people from surrendering after the encirclement and annihilation bombing began. Far from it. Fretilin used the Presidential amnesty to send back the sick and wounded men, women and children so as to strengthen their own ability to fight. (4) The people on many occasions didn’t want to surrender. (5) I do wonder about the line “relentlessly pressing their encirclement campaign from west to east”. That’s sort of true, but ABRI’s operations targeted the east early on, especially the route between Quelicai and Uatu-Carbau in August 1977. This has obvious implications for Fretilin’s C3. The famine was a separate event to the intra-Fretilin fratricide. So it’s quite correct to say, as people often do, that Fretilin detained and occasionally executed people who argued that the population should surrender and that only armed Falintil troops should fight a guerrilla war. But these detentions and occasional executions didn’t occur in the context of a famine. They occurred in the context of the resistance having enough food, water and so on. That’s why there was a debate. – because both sides’ arguments sounded plausible at the time. Hence I wrote here http://www.sussex-academic.com/sa/titles/SS_Asian/fernandes.htm that the debates were never resolved but were overtaken by ABRI’s operations. Once the August 1977 offensives began to annihilate people and destroy food stores, however, Fretilin generally (with a few exceptions) didn’t stop people from surrendering; it sometimes ordered them to surrender and they sometimes refused. We get an erroneous picture if we conflate the fratricide with the famine. We were being attacked from all sides by TNI Infantry, including bombing from planes and mortar every day…Apart from that we did not have food. We did not have anything, but the population did not want to give up. The discipline among the 40,000 people was very high. There was an order to cook only in the evening until 3.00 in the morning. After that nobody was allowed to light a fire as it could attract the attention of the planes. Everyone kept strictly to this for three months. For three months we kept moving along the 40,000 people. And later we saw people could not walk because of hunger or age and they would look for a sheltered area in the caves and sit there, until they died. You would come round a second time and see corpses and then come round a third time and see more corpses, but still they did not want to surrender. Moreover, when the order to surrender finally came, it was not always well received. On 16 February 1979 when we called the people together to tell them we were going to surrender, they were all angry. The people and Falintil felt disappointed and angry. They pointed their weapons at us. They rebuked us: “It was you who taught us to continue the struggle till death. Now all of a sudden you tell us you are going to surrender.” We informed them a thousand and one times, patiently and courteously: “The leaders in Fatubesi have all surrendered. If we don’t surrender, we’ll all die in the forest from the enemy’s attacks and hunger.” Fortunately Rui Fernandes [the former adjunto in the base de apoio, who had already surrendered with most of the other leaders] had sent a letter which had been delivered to us by João Freitas Maria, a platoon commander who had already surrendered. I read out the letter. They saw his [Rui Fernandes’s] signature, and they agreed [to surrender]. But they said to us: “all our suffering at the hands of the enemy will be on your shoulders”.